At any moment, an unhappy customer can share their opinion with the masses through social media and the web and negatively affect your business. That's why it's even more important than ever to create an excellent experience for your customers to help develop your company's relationship with them into love. Walt Disney said it best, "Do what you do so well that they will want to see it again and bring their friends." Creating love between your company and your customers can help scale positive word of mouth that's absolutely priceless. A customer-focused culture of this nature is a business opportunity that should not be overlooked. Most businesses are failing when it comes to the customer experience, which is your opportunity to swoop in and enchant those same customers into falling for your company. Happy customers who get their issue resolved tell 4 to 6 people about their experience. So that's a way to significantly influence the word of mouth about your business. Don't act as a nameless or faceless business; genuinely talk with your customers as a person representing the business. Address your customers by name, and tell them your name at the very beginning of your interaction. Talk to your customers as you would in person, not like you would in a press release. Examples of this are noticeable when it comes to customer service on social media where the genuine shine through and the others seem forced and uptight, which is the opposite of being "social." American Express does this well on Twitter, ensuring all customer concerns are answered in a timely manner with a friendly and personal response, signed by the employee who's doing the tweeting. A third of consumers say they experience rude customer service at least once a month, and 58 percent of them tell their friends. This is exactly how word of mouth can work against your company's reputation for the long term. It's very important to be respectful of a customer's mood when trying to resolve an issue they have with your company. Keeping your patience is key to giving your customer the time to air out their issue. And, in turn, it creates the opportunity for you to help resolve the issue and make them comfortable. The more comfortable the customer is the more likely they'll share valuable feedback that can help prevent similar issues from occurring again in the future. At a time when it's easy to have a two-way dialogue with your customers, it's important to truly listen. When listening to your customers, take into account what changes your organization should make from this feedback, and then follow through. Your customers are the lifeblood of your organization, and not dealing with the reasonable requests could cause backlash. There's never any reason to slow down on satisfying your audience, especially when they're chatting with you live over the phone. It's important to note that 81 percent of companies with strong capabilities and competencies for delivering customer experience excellence are outperforming their competition. Take note, customer satisfaction is a key differentiator in a sea of other companies. Besides offering support, ongoing specials will continue to help enchant and satisfy your customers for the long term. Create engaging multi-channel promotions centered around discounts, giveaways, sweepstakes and contests. Distribute these offers via email, social media, print, in-store and across your other marketing channels for full exposure, much like HairDazzle has done on Twitter above. As previously mentioned, take your customer's feedback seriously and act upon reasonable requests. What's the point of listening if you're not going to act on that feedback? Make sure it's clear that you want your customer's feedback and that your business truly values them as a partner. If you're looking for an example of how to show your customer that their opinion matters, look at what the Buffer app team is doing. Buffer app is a social media management tool that helps businesses and individuals schedule their content for the best times to share and get engagement. The Buffer blog features a variety of quality content focused on marketing, achieving happiness and a monthly series known as the Happiness Report. 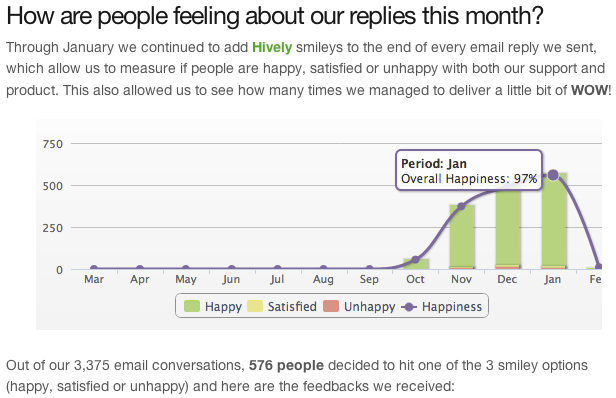 This report highlights how the Buffer team is managing customer support each month by what worked well, what didn't work well, what they plan to work on for the future and finally, a request for feedback from their customers. This is a lesson for all businesses on how to be completely transparent and actively allow your customers to partake in improving your product for the future. Focusing on your customer to this degree is a major way to strengthen their trust, loyalty and overall love for your company. It takes 12 positive service experiences to make up for 1 negative experience. This is how sensitive trust is between a business and its customers. No matter your size, keep your customers in the know when it comes to positive and negatives changes to your products and services that affect them. It's crucial to tread lightly when making changes to your products and services because your customers have become accustomed to what you've already got. Recently, Instagram updated its terms of service but neglected to be clear about the changes that would be made to the social network. The wording was confusing, and therefore, the company's intentions were not clear. Their users immediately voiced concern across the web about these changes. 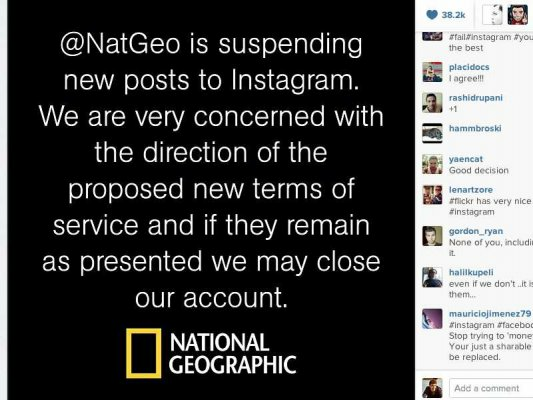 Most of this feedback was outrage and many left the service or threatened to leave, like power user National Geographic. Instagram quickly responded to the outrage and reversed their decision to update their terms of service. In the end, the situation was handled well in terms of the cleanup; but now, due to the poor communication around their terms of service, Instagram has lost the trust of their audience, which is hard to regain. Tell your customers when you've made a change, you've screwed up, or you've done something right. A healthy mix will give your customers a transparent look into your company that can't be forged. Being transparent in the digital age is a must. Much like the principles discussed above, transparency is a critical factor in building trust, satisfaction, and love from your customers. What does it mean to be transparent? Transparency means your employees' personal and work persona blur. Your word is your bond. Following up on your promises helps show the transparency of your business, while helping to build a feeling of trust and dependability with your audience. F.W. Nichol said it best, "When you get right down to the root of the meaning of the word 'succeed,' you find that it simply means to follow through." Highlight phrases for your company to use that'll make your customers happy. Again, consistency and a personal touch go a long way. Never let your customers forget your business by following up effectively. Keep it personal by following up on special occasions and consistently writing handwritten follow-up notes. Define how to deal with unsatisfied customers with action steps to ensure there is a thorough process for all employees to follow to resolve a customer issue, ideally turning unhappy customers into your strongest advocates. Last, but certainly not least, always say "Thank you." As many as 3 out of 4 customers say they have spent more with a company because of a history of positive experiences. Kindness and gratitude for a customer's business is an undeniable way to further enchant them for the long term. Craft every thank you sent out from your company to be specific to the customer, relevancy is key. Be as appreciative as possible to your customers for taking the time to go through the process of resolving their issue. Finally, follow up with a good old fashioned "Thank you." A version of this blog appeared on the KISSmetrics blog.